I have had such a wonderful day out with my daughter Rachel. Our date started with a venture through one of our favorite shops - IKEA. We have both always loved wondering around Ikea, even when we were on holiday in Vancouver we still had a wander. After we had bought what we needed and wanted we then went onto another favorite place. We went to "TGI Fridays" for a yummy lunch. Rachel and I have had many a date at good old "TGI Fridays" - we love the food and have our definite favorites and today was no different. They only difference today was I don't normally eat desert but somehow Rachel talked me into ordering this rather large Hot Chocolate Ice Cream Sundae - even though I knew I was being a bit of a piggy I still ate it. Rachel is now 6 months pregnant and today I felt my grand baby kicking, wow how amazing. 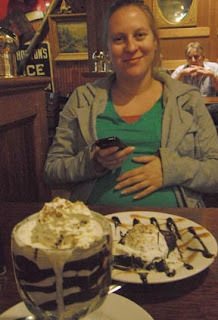 This was actually the first time I have ever felt a baby kick - other than when I was pregnant. What a great great day with my baby and her baby. It is so exciting to feel a baby kick especially when it is part of you. You will love being a grandmother. I know I do!